Hello everyone! It's time for another fabulous and fun blog hop with The Stamp Review Crew! 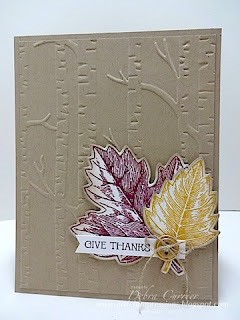 This time around we are featuring projects that use the Vintage Leaves stamp set! I am your stop right after Tanya Boser! I am loving this stamp set and coordinating framelits! I had a lot of fun creating this simple card for this hop! Take a look! Super simple!! Time for you to go and check out what Heidi Baks has created! Thanks for stopping by and have a super day! Such a sweet card, Debra! I love the leaves on the Woodland EF, so pretty! Great card, Deb! It's so clean and simple and perfect!! Oooohh, I love that embossing folder in the background. What a great choice to go with the leaves! Love that pop of fall color against the embossed background! Pretty card! I love your fall card. It's simply beautiful! This is beautiful, Deb. It's so simple yet so dramatic! The trees are perfect for your leaf cluster. Amazing! That embossing folder combined with Vintage Leaves is a match made in Heaven. Your created a winner! Love the leaves against the woodland background. Beautiful combination of mini and main catalog items, and your layouts are always perfect!